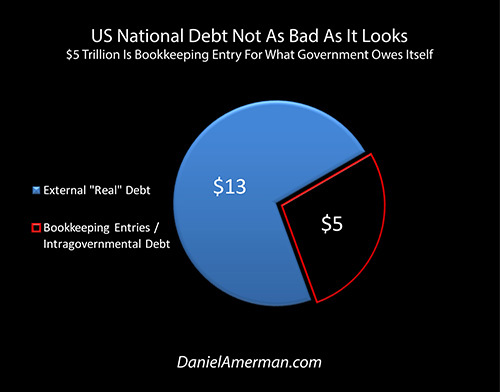 We are told that many economics experts don't worry about the total national debt because $5 trillion of that debt doesn't really exist; it is rather just a theoretical bookkeeping transaction for money that the federal government owes to itself. Netting out this bookkeeping entry then allows some authorities assert that while the debt is a bit on the high side relative to the size of the economy, it is far from historically unprecedented, and certainly no cause for despair or rash talk about insolvency. We are also told that many financial experts don't worry about the solvency of Social Security and other federal government retirement programs, because they are funded with $5 trillion of the safest assets on earth, those being United States government Treasury obligations (i.e., the national debt), which are being held for our benefit by the federal government. Unfortunately, both statements cannot be true simultaneously. That is, if the $5 trillion in retirement Trust Fund assets are real, then the full national debt is real – and we are in a lot more trouble than many economics authorities say we are. On the other hand, if the $5 trillion in US Treasury obligations held by Social Security, Medicare and other government retirement programs aren't entirely "real", then these programs don't have any real assets whatsoever – and we are in a lot more trouble than many financial authorities say we are. What makes each of the two halves of this contradiction so widely accepted is that they are usually presented as being two entirely different issues. The national debt is a very complicated subject, and most people neither fully understand it nor particularly want to think about it. If they are reassured that economically educated people think that the debt isn't really nearly as bad as it looks, then they are unlikely to question this good news. 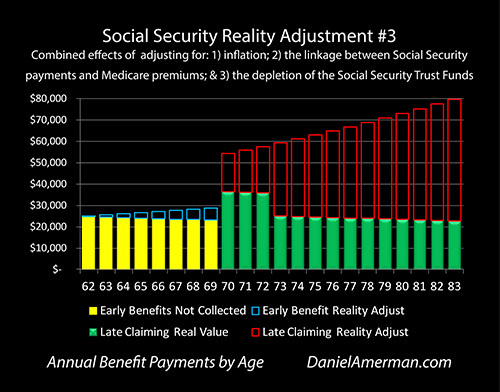 How the Social Security Trust Funds really work is treated as an entirely different subject. In this case it is an even more complicated subject, which even fewer people fully understand or want to think about. So if the federal government is telling them that the money is absolutely, definitively "in the bank", then they are unlikely to question this reassurance. However, once we accept the basic truth that it is the same $5 trillion in government obligations which is being discussed in each case, then the simple question becomes: is it real, or isn't it? Whether the US Treasury obligations that constitute the assets of Social Security and other government retirement programs are "real" is actually the lesser problem – and the lesser contradiction. There is a much bigger question – and contradiction – which is where the money comes from to pay for Social Security and Medicare scheduled payments that are in excess of expected payroll taxes. In 2012, the newspaper USA Today calculated that unfunded Social Security obligations alone were over $22 trillion – an amount well in excess of the 2015 official national debt of $18 trillion. Add in other unfunded obligations – primarily Medicare – and in a 2011 article USA Today found that the total came to about $62 trillion of "off-balance sheet debt". That is, the federal government uses a very special accounting that is not legally available to corporations or individuals, precisely so that it can report lower debt totals – and lower annual deficits – than any other sort of entity would be able to do. Add this to the official national debt of $18 trillion, and the total then came to an astonishing $80 trillion (although it has grown in the years since the report was done). 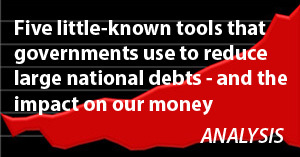 As reported in the Wall Street Journal in December of 2012, when Archer and Cox (former chairman of the House Ways & Means committee and former SEC chairman respectively) took a look at the true level of national debt, they found – primarily based on the figures from the Social Security and Medicare trustee reports – that the true national debt was $87 trillion, consisting of $17 trillion in (then outstanding) official debt, and $70 trillion in unfunded obligations, most of which were payments to future retirees. And for those who are familiar with the well-known usdebtclock.org website, which keeps running real time totals of estimated US national debts and assets, as of December of 2015 they showed that the total unfunded obligations of the US government were about $100 trillion under GAAP (Generally Accepted Accounting Principles), which when added to the official debt in 2015, brings the total to $118 trillion. As my long-time readers know, this subject of the conflict between governmental and private promises about the future – and the quite different resources likely to be available to pay for those promises if we assume even normal economic growth – has been a particular interest of mine for many years now. And for a time, it looked like this major problem that has been developing for so many years was finally getting the national attention it was due. Until it wasn't. If you look at the dates of those formerly widespread media reports, they ended some time ago. What happened was that knowledgeable authorities worked it all out, and established why this was (purportedly) a factual non-issue that financially literate people simply shouldn't worry about. The key, they say, is to understand that all those numbers you see in the Social Security tables about future payments aren't actually promises, and the same is true about Medicare payments. Technically, the government has not promised to give us anything that it doesn't have the cash to pay for. 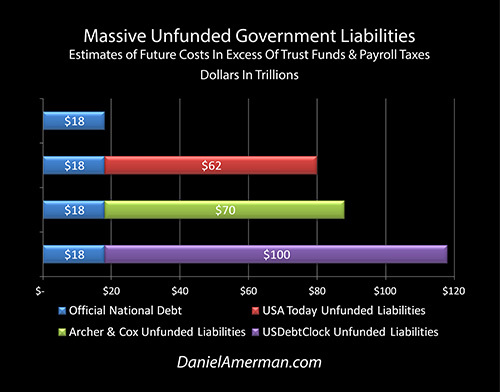 So if the Trust Funds are depleted, and payroll taxes are not sufficient, then the payments are simply not made above what taxes will cover. 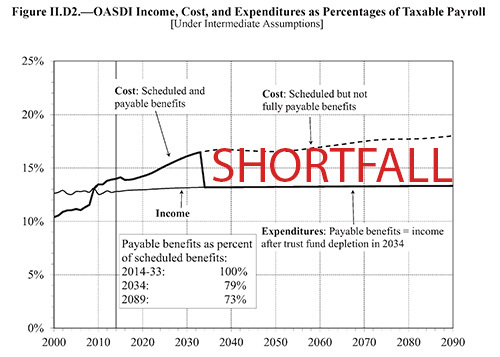 The above is excerpted from the 2015 Trustee Report for Social Security (only the word "SHORTFALL" was added). To begin with, it should be noted that this projection is based on a series of quite optimistic assumptions including robust economic growth, full employment with rising workforce participation rates, ever-increasing productivity, steadily rising real wages, and highly productive young immigrants coming to the US in numbers and contributing substantial payroll taxes for the good of us all. The crucial words are "scheduled but not fully payable benefits", and they are the top line on the right. The line below is for expenditures, and it is simply "payable benefits". So the top line is what people are told they will be getting, what the Social Security schedules say the payments will be. The bottom line is what they will actually be getting under those quite optimistic government projections. And the difference, the "shortfall", does not come from the government putting more money in, but rather from a reduction of payments to beneficiaries. Now, the key accounting concept is that if the government hasn't actually legally obligated itself to make Social Security and Medicare payments, then they aren't real debts. And because they aren't real debts, that means they don't actually have to be counted at all, and therefore the US government isn't ridiculously insolvent after all. Well, there you have it. The government doesn't actually have any legal obligation to make future Social Security and Medicare payments in full, and therefore it is not bankrupt, and therefore there is no problem (or so the Talking Points go). And the issue thus (mostly) went away, at least in terms of media coverage. 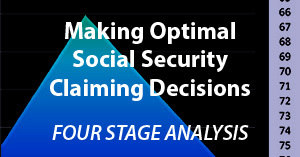 There is something else that the federal government and many leading financial authorities are quite emphatic about, which is that for most people there is a major financial advantage to waiting as long as possible before collecting Social Security benefits. People can start collecting at age 62. But the longer one waits, the larger the monthly payment, and according to the schedules – this is true for life. Situations vary widely and the specifics can be essential (particularly with regard to spouses), but for many people, waiting until age 70 can produce six figures in additional money from the government, as compared to early claiming. 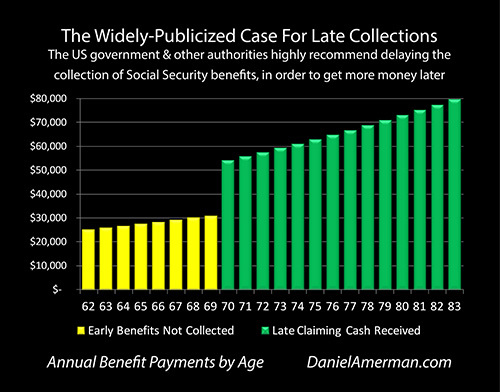 What these very common Social Security "late claiming" strategies have in common is that they assume that every dollar of what is scheduled will be paid. So there are no shortfalls. But the problem is that effectively the entire cumulative dollar advantage to waiting is in the distant future – which is where the shortfalls are. So what we have here is a contradiction that dwarfs the $5 trillion Trust Funds contradiction. If we take the average of the various estimates of unfunded government promises, and add in the official national debt, and then divide by the number of above-poverty line households in the United States, then the average cost per household is a little over $900,000. Are you personally good for your $900,000 share? Are your children and your neighbor's children good for their $900,000 shares (on top of making their student loan payments)? Now, if you and those around you can't each come up with six figures in extra cash to cover the shortfalls that have to be covered, then where exactly does the money come from for you to receive the six figures in extra cash from Social Security payments that you are assured you can absolutely rely upon, and are scheduled to be paid out 15, 20, 25 and more years from now? It is true that the bulk of the tens of trillions of shortfalls are 30 years and more from now. But nonetheless, even with the highly optimistic government projections, the shortfalls can begin as soon as 2028 to 2034, which is very relevant indeed for someone making a decision today or in the next few years. 1. Financially literate people know that not all of the national debt is real, because $5 trillion is just a bookkeeping entry for what the government says it owes to itself, with little real economic significance. 2. 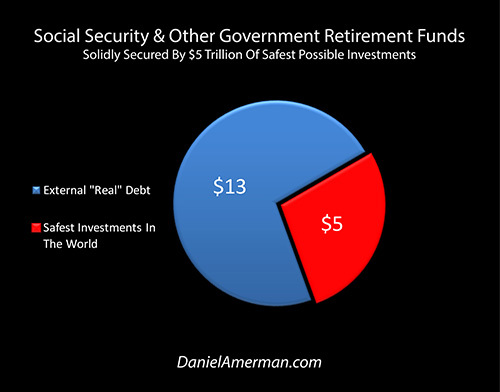 Your Social Security and government retirement benefits are absolutely safe because they are secured by $5 trillion of the safest of all investment assets, those being treasury obligations backed by the full faith and credit of the United States government. 3. Financially literate people know that the well-publicized claims of the US government being $80 to $100+ trillion in debt are simply not true, because while the massive projected shortfalls do exist, the government hasn't actually legally promised to cover those shortfalls, and under current law the shortfalls can instead be covered by large future reductions in Social Security and Medicare payments. 4. 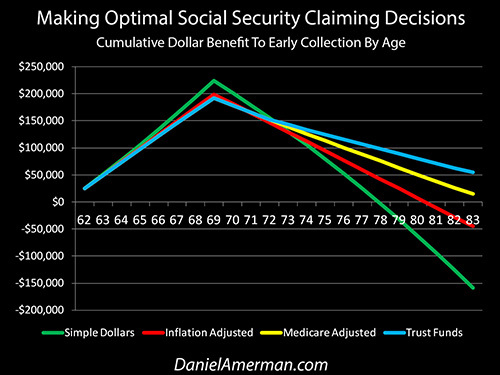 Your receipt of future Social Security benefits as scheduled can be absolutely relied upon, and therefore you can comfortably make the retirement decisions that will determine your future standard of living for decades based on the certainty that the government will make its payments in full and with no reductions. Now, the interesting part is that all four assertions are quite reassuring for the general public, and they are all presented simultaneously. 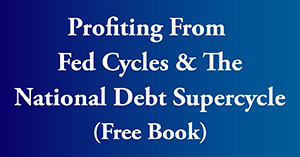 What enables this simultaneous presentation – and keeps the otherwise glaring contradictions from being evident – is that the national debt and public retirement benefits are treated as being two entirely different subjects. The national debt is the security for Social Security. Even though this truth is self-evident, it is rarely presented in this manner. Because when we accept this underlying reality, then we also see that there are no longer two entirely separate issues, but rather the national debt and government retirement benefits are two sides of the same coin. And the moment this becomes clear, then the many contradictions also become crystal clear. Because the national debt is the source of the payments from the Trust Funds that Social Security is dependent upon, we can't say that the national debt isn't as bad as it appears – without also saying that the security for Social Security isn't nearly as good as we think it is. Yet, if we say that the security of Social Security making cash payments to retirees is rock solid – then the other side of the coin is that coming up with the cash to make payments of principal and interest on the national debt needs to be absolutely rock solid as well. 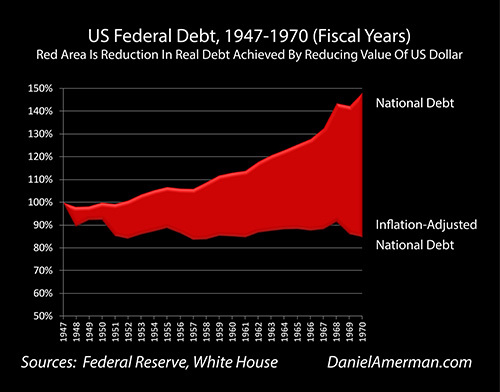 More fundamentally still, where does the money come from to pay off the national debt? 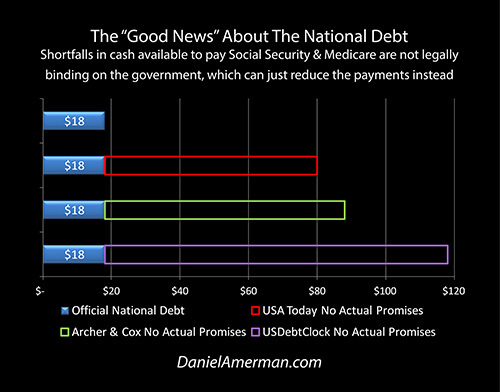 And if the national debt isn't repaid – then how is it that Social Security gets paid? Similarly, the amount of money which the federal government must come up with in coming decades, and the future of Social Security payments, are also two sides of the same coin, albeit on a much larger scale. If the government is actually required to make those payments in full, and cover the shortfall difference between what comes in from payroll taxes and what has been promised to retirees, then it has to come up with many tens of trillions of additional dollars, an amount that dwarfs the current national debt. Is it feasible to believe this could happen? Yet, if we believe that the scheduled payments will be made in full into the indefinite future, then doesn't the money have to come from the government? Finally we need to consider just what it is that creates the future scheduled payment shortfalls. The shortfalls come into being because those are the years when the Social Security Trust Funds are projected to be have been depleted. Which means we have serial contradictions. If we are to believe the good news about the national debt, then there are no real assets to support Social Security, this continues until the bookkeeping entries run out, and then there are huge shortfalls when it comes to making scheduled payments in full, because the government has not legally promised to make those payments. Conversely, if we are to believe the good news about Social Security, then the government has to come up with the money to repay $5 trillion of the national debt over the next 12 to 18 years (when we include other government retirement programs), and then another $60 – $100 trillion over the decades after that. When we accept that it is the government that has to come up with the money to cover government retirement payments, then obvious as that sounds – we lose the ability to have what is routinely presented as being two completely different futures. There can no longer be one future where the government isn't broke because it isn't legally obligated to make the payments. While simultaneously having another future where everyone delays collecting their retirement benefits as long as possible, because the government does make all the payments. Instead, the reality is that there is only one future, and either the government comes up with all of the money, or it doesn't. And if it is improbable to believe that it will come up with all of the money, then it is improbable to believe that the full payments will be made. What you have just read is an "eye-opener" about critically important retirement decisions. 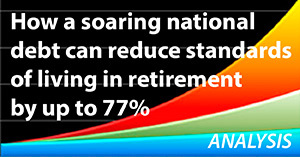 Retirement lifestyle is determined by both benefits and savings. 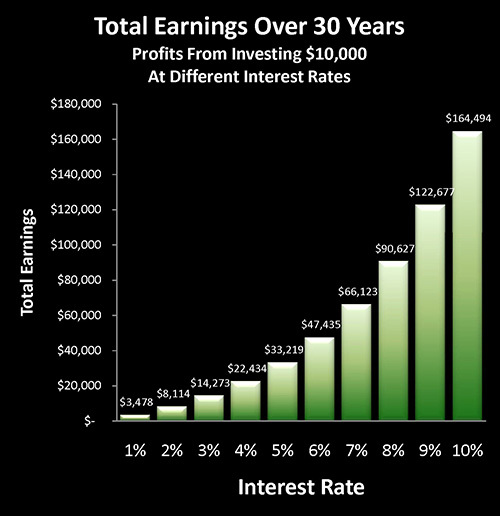 Linked here is a related "eye-opener" that shows two sides of a related coin, including how the government's suppressing interest rates can reduce retirement investment wealth accumulation by 95% over thirty years, and how low interest rate policies are profoundly reducing standards of living for those already retired. The stakes are high for the government when it comes to the national debt – and that is also true of Social Security. And once again, the numbers don't quite work the way many people think. The government strongly encourages people to wait as long as possible before collecting their retirement benefits – but as explored here, is that truly in your best interest, or are a few factors being left out?